Thirteen is when a Beaumont’s savvy hits—and with one brother who causes hurricanes and another who creates electricity, Mibs Beaumont is eager to see what she gets. But just before the big day, Poppa is in a terrible accident. And now all Mibs wants is a savvy that will save him. In fact, Mibs is so sure she’ll get a powerful savvy that she sneaks a ride to the hospital on a rickety bus with her sibling and the preacher’s kids in tow. After this extraordinary adventure—full of talking tattoos and a kidnapping—not a soul on board will ever be the same. 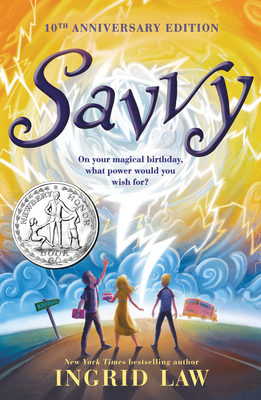 Ingrid Law received a Newbery Honor for Savvy, her first book. She lives in Boulder, Colorado.